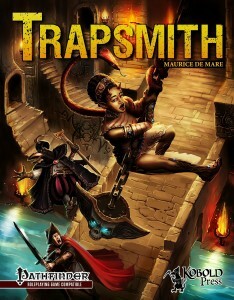 Maurice de Mare, trapsmith and author of the traps and adventure you’ll find in the Trapsmith book by Kobold Press, has taken several minutes of his time to answer a few questions for us! 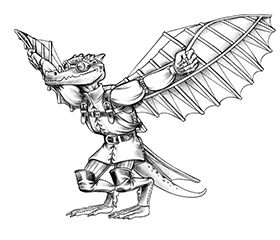 Come see what he has to say about designing traps, playtesting the adventure, and Paizo’s RPG Superstar. You’ve been a long-time contributor to Kobold Press with your Trapsmith blog articles and now your Trapsmith book. What about traps keeps drawing you back in? The design and the result it brings. Let me explain further. After designing hundreds of traps, I’ve come to realize that designing traps is strongly related to something else that I enjoy doing: fencing. Fencing, or any other combative skill, is all about action-reaction. You can win by being stronger or faster, but there is always someone stronger or faster, so to keep winning you need to be smarter. In fencing, that means you need to feint and attack with a second intent. So when designing traps, I set up the initial strike, think of a likely counter and have something ready to deal with the counter if or when it comes. I like engaging in that sort of thought process, so it is very rewarding. I’ve also come to realize over the years that I like to design new and exciting ways to hurt people—characters, I mean. Saying it aloud like that makes me feel and sound like an awful person (I am actually pretty nice), but with traps there is always something new that can be tried. A wide-open design space is such a generous gift. What do you find most challenging and most rewarding about designing traps? I’ve talked about some of the rewards already, but when I was doing the Gavin series, it was very rewarding to see all the suggestions from the readers for items that could be used for trapsmithing, so a big thank you to everyone who made a suggestion. Some of those items posed a challenge, but that made it all that much more fun to create a trap out of them. When you were working on the adventure for Trapsmith, you playtested it. Any fun stories from the playtest process? For playtest purposes, I introduced a “save” before each encounter, so we could repeat them and see how different tactics worked. So final encounter, the doors open and the group sees a dozen kobolds seeking cover behind the pillars that support the cathedral. Eager for blood, they charge! So the trap activates, the camel and paladin rider gets hoisted to the ceiling and bloody mayhem ensues. They complete the encounter and a short discussion follows about taking a different approach: They’ll move left and right around the pillars and mop up the kobolds in a different fashion. So we reset to the last “save” and there they go: The doors open and the group sees a dozen kobolds seeking cover behind the pillars that support the cathedral. Eager for blood, they charge! So, in subsequent rounds, you get the confused players interacting with each other: “Hey, weren’t we supposed to flank them this time?” Kobolds—their presence alone foils any sane attack plan! Players just want them dead, dead, dead! You did well during the first few rounds of the most recent RPG Superstar. What was that experience like? What did you enjoy most about it? What did you learn in the process of working on your submissions? Well, I’ve learned that wanting to be in the Top 32 of RPG Superstar is not the same as being in the Top 32 of RPG Superstar! It was the sixth year I entered, and I came close to being picked by the judges in 2011 and 2012, but following the competition is not the same as being in competition. You can literally feel the entire gaming world watch your every move—you don’t want to implode under that pressure, so it is stressful, hard work and such a relief if you advance a round. I think I really enjoyed the challenge of it all. It is not easy, and that makes it all the more worthwhile. What I learned while in competition is that writing all those traps on the KQ blog was valuable writing experience. If you don’t keep in practice, you can never design / write / re-write quick enough to keep up with the competition. The practice also allows you to turn in solid stuff. I know the public recognizes a solid effort and most of the time they will vote for something solid and usable over something great but incomplete. At least, I think that is what got me through the archetype round. My entry was my very first archetype ever, and it was solid but not great. I also learned that my writing can evoke some serious feelings: people hated and loved my monster. And, as a writer, evoking serious feelings is what you try to achieve. In a few more months, the RPG Superstar season will start again, and I look forward to it already. It is a great experience. Even if you are not picked, you can learn so much from it. But remember, entering is easy—the competition is fierce! 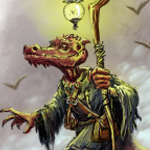 You can snag a copy of Trapsmith in at Paizo, DriveThru RPG, or RPG Now! If you have a question relating to traps and or the book, please ask. You are talented at traps to challenge and destroy PCs. How about a few more to aid them? Something that might be found around a home base perhaps or maybe a few more designs for the Ranger (Trapper) archetype? You mean more boon traps? I really can’t say no to requests, so I’ll see what I can do. Can’t say I am familiar with the archetype, but let me see what it does.